First SLM as a TLA (Three Letter Acronym). If you would Google what is the meaning of SLM the most common meaning is Hello, often said on IRC, this is short for “salaam”, or hello. In the context of PLM it is a relative new acronym and the discussion on LinkedIn was also about the fact if we needed a new TLA. In general. What we try to achieve with SLM is: the ability to trace and follow existing products at customers and to provide advanced or integrated services to them. In a basic matter this could be providing documentation and service information (spare parts information). In an advanced manner, this could be thinking about the Internet of Things, be products that connect to the home base and provide information for preventive maintenance, performance monitoring and enhancements, etc. The topic is not new for companies around the world that have a “what can we do beyond PDM” vision, as I was involved already in 2001 in discussion with a large Swiss company providing solutions for the food processing industry. They wanted to leverage their internal customer centric delivery process and extend it to their customer support using a web interface for relevant content: spare parts lists and documentation. For many industries and businesses the customer services (and the margin on spare parts) are the main areas where they make a sustainable profit to secure the company’s future. Most of the time, the initial sale and/or delivery of their products are done with relative low margin due to the competitive sales situation they are during selling. And of course the sale itself is surrounded with uncertainty which vendors have to accept. If they would ask for more certainty – it would require a more detailed research, which is costly for them or considered as a disadvantage by their potential customer. As other competing vendors do not insist on further research, your company might consider not being “skilled” enough to estimate properly a product. The above paragraph implicitly clarifies that we are mainly talking about companies, where their primary process is Engineering to Order or Build to Order. For companies where the product is delivered through a Configure to Order or an Off-the-Shelf approach, there is no need to work in a similar manner. Buying a computer or a car has no sales engineering involved anymore. There is a clear understanding of the target price and of course resellers will still focus on differentiating themselves by providing adjacent services. In a real Engineering to Order process, traditionally the company that delivers the solution to the client will not be really involved in the follow up of the lifecycle of the products delivered. The delivered product (small machinery, large machinery or even an installation or plant) is delivered to the customer and with the commissioning and handover a lot of information is transferred to the customer, based on the requirements of the customer. Usually during this handover, a lot of intelligence of the information is gone, as the customer does not have the same engineering environment and therefore requires information is “neutral” formats: paper (less and less), PDFs (the majority) and (stripped) CAD data combined with Excels. The information battle here between the ETO-delivery company and the customer is, that the ETO-delivery company does not want to provide too much information to the customer, to make the customer fully independent, as the service and spare parts business is the area where they can make their margin. The customer, however, often wants to have ownership of the majority of data, but also there is the awareness if they ask too much; they will pay for it (as an engineering company will consider this as extra work). So finding the right balance is the point. However, the balance is changing, and this is where SLM comes in. The owner of the equipment is no longer the owner, but pays for the service to perform the business. Very similar to SaaS (software as a service) solutions. You do not own the software anymore; you pay for using it, no matter what kind of hardware / software architecture there is behind the offering. In that case, the Engineering to Order company can provide much more advanced services when they extend their delivery process with capabilities for the operational phase of the product. As a more integrated approach eliminates the need for this disruptive handover process. Data does not need to be made “stupid” again, it is a continuous flow of information. How this can be done, I will describe in an upcoming, more technical, blog post. This approach brings value to both the Engineering to Order company and the owner/operator of the product / plant. As it is a continuous flow of information, I would like to conclude this topic by stating that, for Engineering to Order companies, there is no need to think about an extra SLM solution. You could label the last part of the PLM process the SLM domain. As the customer data is already unique, it is just a normal continuation of the PLM process. Engineering to Order companies are still discovering the advantages of PLM to get a cross-project, cross-discipline understanding and working methodology for their delivery process. Historically they were thinking in isolated projects, where the brain of experienced engineers was the connection between different projects. Now PLM practices are becoming the foundation for sharing and capitalizing on knowledge. In the Build to Order industry, the company that delivers a solution to their customer, has tried, in a way, to standardize certain parts of their total solution. These parts can be standardized/configurable machinery or standardized/configurable equipment, or even a level higher standardized systems and subsystems. One process, the main process for the company, fulfilling the customer need. In this process it is about combining existing solution components and engineering them together in a customer specific solution. This could be a PLM delivery model like ETO. So within a company, there might be the need for two different PLM solution processes. From my observations in the past 10 years, companies invest in PDM for their R&D process and try to do a little of PLM on top of this PDM implementation for their delivery process. 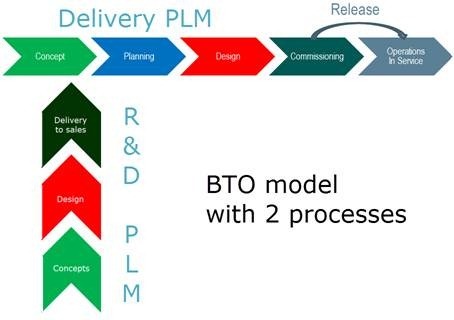 This basic PLM process usually focuses again on the core of the engineering process of delivery, starting somewhere from the specifications till the delivery of the solution. So “full” PLM is very rare to find. The front end of the delivery process, systems engineering, is often considered complex and often the customer does not want to engage fully in the front end definition of the solution. “You are the experts, you know best what we want” is often heard. Ironically in an analogue situation this is often the case of PLM implementations at risk. Here the company expects the PLM implementer to know what they want, without being explicit or understanding what is needed. Do we need two PLM implementations within one company ? One for R&D and one for the delivery process ? The amount of R&D activity is so low compared to the delivery process; the main PLM system can support this. Reading these two options, it brings some clarity. If the R&D process is a significant differentiator and you are aiming to serve many customers, it makes sense to have two PLM implementations. Still two PLM implementations could be based on the same PLM infrastructure and I would challenge readers of this post to explain why it should be a single instance of a PLM infrastructure. I believe based on the potential huge amount of data a single instance would create a data monster, where we can see that connected systems (using big data) is the future. In other concepts there is an enterprise PLM and local PDMs exactly because there is no single system that can do all in an efficient manner. Still I haven´t talked about SLM, which could be part of the delivery process, where you manage customer specific data. For that, more detail in my next blog post, there is are some data model constraints for the PLM system. I would state you only can use a separate SLM system if you are not interested in data from the early phases of the delivery process. In the early phase, you use conceptual structures to define the product /installation/plant. These conceptual structures are to my opinion the connection between the concept phase and the service phase. Usually tag numbers are used to describe the functional usage of a product or system, and they are the ones referenced by service engineers to start a service operation. You might be confused at this time, as I did not bring the various information structures into this post to clarify the data flow for the delivery process. This I will do in my upcoming post. Why not CTO and SLM ? I haven´t discussed Configure to Order (CTO) here, as I consider CTO a logistical process, which logically is addressed by the ERP system. The definitions of the configurations and its related content probably will be delivered through a PDM/PLM system, so the R&D type of PLM system will exist in the company. SLM most logically would be performed in this situation by the ERP system, as there is no PLM delivery layer. Having said this, a new religion discussion might come up. Is SLM a separate discipline or is it part of the ERP system? 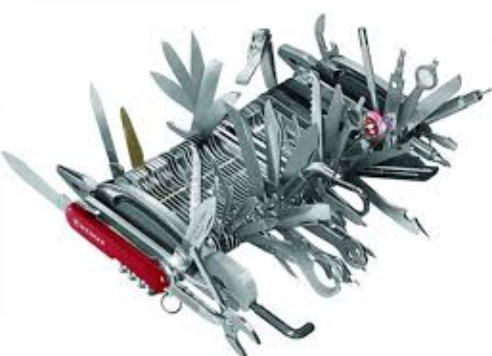 This topic is no discussion for the big ERP vendors – they do it all J, but it is up to your company if a Swiss knife is the right tool to work within your organization. Do we need SLM ? Perhaps yes as a way to describe a functional domain. No when we are talking about another silo system. I believe the future is in connectivity of data and in the long term PLM, ERP and SLM will be functional domains describing how connected data will serve particular needs. much wisdom in this post. Thanks for taking the time to write it. Would like to comment from a standards perspective. Recent harmonization PLCS (STEP AP239) and AP 242 will deliver much of what you ask for – once implemented in solutions of course. By focusing on the information we might also be able to break away from the current assumption that there have to be systems targeting ERP and PLM (and SLM). By using the information models that are based on user needs and not SW vendor driven we will be able to use best of breed for the complete “PLM system”. Agree, it will not be provided by one vendor or in one SW product. I agree with everything you have written here and Hakans response makes me smile. I fight against the narrow definition of PLM underpinned by the software vendors everyday. I try and take the business back to the PLM ideal, the business strategy which of course covers SLM. I show the links between CRM, IBP, PLM and ERP as being the full PLM system and it gets credit. Unfortunately, it gets compromised as soon as the software vendors get involved because the constraints are in their software – when actually if we stayed to the business strategy and process, we could easily link the best bits of a suite of software, linking to a traditional PLM vendor database to provide consistency in the data model and standards. I do think things are changing and traditional PLM vendors are looking for the “help” that allows that to make that stretch, perhaps them PLM will finally have its day.